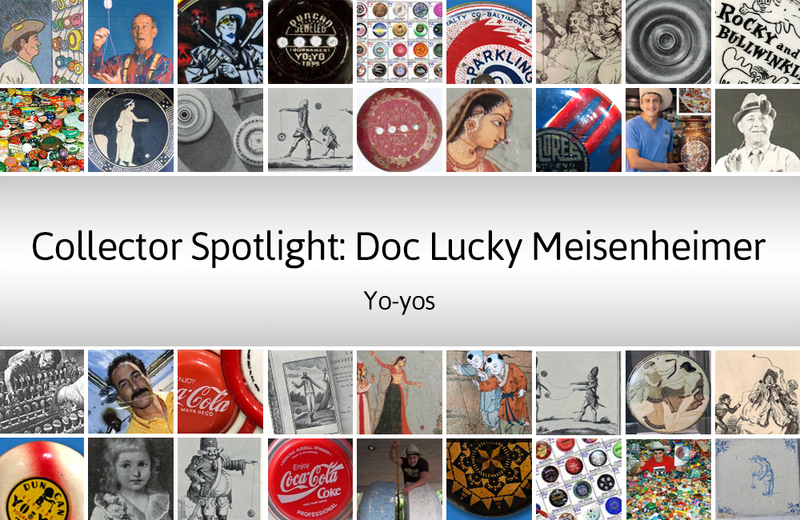 Doc Lucky Meisenheimer collects yo-yos. We talk with the Doc about the origins of his passion for the toy and discover why he’s just as famous for his displays as he is for his collection. I own over 4500 unique yo-yos. If you include the duplicates and the yo-yos that are similar but with different colour variations, I have well over 10,000. The oldest yo-yo in my collection is from the 1780s; a hand-blasted yo-yo from England. I do own a rare Japanese base that is about 1100-years old. It was repaired about 200 years ago using a process that includes bronze or brass that is commonly used in museums. The base is the oldest known piece of artwork that depicts the yo-yo. It’s priceless. My collection also includes yo-yo advertisements and other related memorabilia. How long have you collected yo-yos, and why did you start collecting? I’ve been collecting for about 30 years. Like many people, I played with the yo-yo as a child. That was during the craze of the 1970s. When I got into medical school, I played with the yo-yo as a way to pass time between classes. I discovered a trick book produced by Duncan, a major yo-yo manufacturer. I became proficient using the trick book and thought I was pretty good at it. A few years later, I picked up some wooden yo-yos that were just like the ones my dad had. Around that same time, Yo-Yo Times magazine began publishing and Tommy Smothers came out with his Yo-Yo Man routine. I didn’t know too much about yo-yo culture at that point but I became fascinated by the history of the toy and started talking with collectors and historians. My passion grew from there. This was before eBay, so I would mail a list of yo-yos I was looking for to other collectors and that’s how I grew my collection. I’ve since written a book about yo-yos, been recognized by the Smithsonian, and I’m in the Guinness World Records for the largest yo-yo collection. My collection is housed in my home library. I designed a two-storey display with an ironwork staircase and walkway around the second floor. The cases are fashioned from mahogany and glass. I’m probably more well known for my displays than I am for the yo-yos! What do you consider to be the Holy Grail of yo-yos? The Flores yo-yo. Pedro Florez immigrated to the United States from the Philippines. He noticed a lot of money was being made by someone who produced a toy that consisted of a ball and string. He played with something as a boy he thought was more interesting, so he made what is now called the yo-yo. Flores hosted the first-ever yo-yo competition in Santa Barbara in 1928. He later sold his small yo-yo company to Duncan and worked for them as a demonstrator, travelling around the country to promote the competition – the competition helped make the yo-yo so famous. You’re really not a Jedi yo-yo collector until you have a Flores in your collection. What advice would you give to someone who is interested in starting a yo-yo collection? Don’t think you’re going to put your kids through college with your collection. Collect because you love yo-yos; the chances are you won’t make any money through your collection. What resources do you use to acquire knowledge about yo-yos and connect with other collectors? eBay is a great place to learn what is out there. Old catalogs, articles, and ads are helpful, as is connecting with other collectors.